This popular resort combines modern luxury with authentic Mexican charm in a lush beachfront setting. Each suite offers an ocean view and amenities to meet your every expectation. 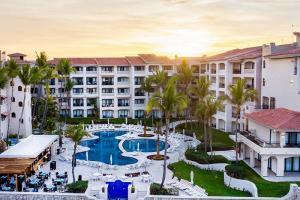 Noted for friendly service and delightful activities, Pueblo Bonito Mazatlán is ideal for families or romantic getaways. Unwind beside your choice of two pools or stroll one of the longest stretches of beach in Latin America. Dine casually at Cilantro's overlooking the beach or at the elegant Angelo's, one of Mazatlán's finest restaurants. The hotel is located 45 minutes from the airport and 5 minutes from downtown Mazatlan. Angelo's (Italian Cuisine-Reservations Preferred), Cascada's (Sandwiches and Drinks), Cilantro's (Seafood), and In-Room Dining.